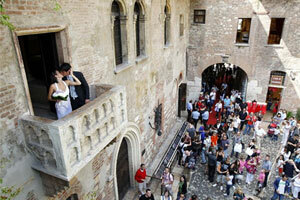 What more romantic city than Verona, the setting of Romeo and Juliet? The recent opening of Juliet's balcony for weddings is bound to be a major draw. Verona Arena, the ancient Roman amphitheater of world importance, alone attracts over 500,000 visitors annually to its spectacular opera performances. Other major factors for inbound tourism: Garda and the Italian Alps. The area's inbound touristic flow is an entire 16 million per year. The most important city built in Italy by the romans, second only to Rome. This is a year-round destination: Summer season visits to Lake Garda and the historical cities are balanced by winter sports in the Italian Alps – the Dolomites. 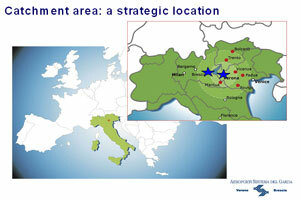 A rich seam of export thriving medium-sized businesses populate the Verona airports' catchment area. The Garda airport cover a catchment area of 10 million inhabitants. Further on this profile will explain the economic potential and general characteristics of these provinces in greater detail. However, it should be noted that these local characteristics are well represented on the Board of Directors guaranteeing a strong level of regional ‘brand loyalty’ from an airport system centrally serving a market of 13 provinces within a radius of only 130 km. Garda LakeSo praised by the poet Catullo, Garda Lake was the cradle of ancient civilizations. It is the biggest and more typical subalpine lake. 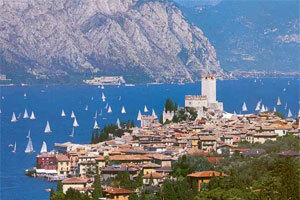 Full of typical villages, in 2010 Garda lake reached more than 4.000.000 incoming tourists. Garda Lake it’s also famous for the possibility to enjoy your time doing sports: sailing, trekking, mountain bike, horseback, and golf thanks to the beautiful sport clubs. Close to the lake there are also several amusement and Natural Parks, like Gardaland or Sigurtà Park or the famous Thermal Park in Sirmione. Or you can enjoy your time spending some hours walking on Monte Baldo, in Malcesine, taking the efficient cableway. It’s one of the newest cableway in the world, from which you can admire the beautiful lake. Dolomites areaTrento: Trentino’s provincial capital, surrounded by mountains. Venue of many cultural events, Trento is an important city especially for winter tourism, thanks to its location, close to the most scenic Italian valleys.Madonna Di Campiglio: pearl of the Dolomites, famous for its mountains and long ski runs. Adamello: famous for its natural Park, one of the most important in Europe, with 48 lakes. Bolzano: known as The Door to the Dolomites, it’s a city for economic and cultural meetings thanks to its important fairs, its new foreign languages university ant its strategic position. Verona, located in Veneto, (northern Italy) is the fourth tourist destination in Italy, thanks to its artistic heritage, several annual fairs, shows and operas, such as the opera season at the Arena, the ancient amphitheatre built by the Romans.Verona owes its historical and economic importance to its geographical location, in a bend of the Adige River near Lake Garda. Verona was the birthplace of the poet Catullus, and the town Julius Caesar used to choose for his relaxing stays. During the centuries many important personalities spent here a part of their life here, from Charlemagne to Dante, Goethe and Stendhal. But perhaps the main reason why Verona is known all over the world, is due to the tragic love story of Romeo & Juliet, one of the most famous Shakespearean plays. Walking around the city you can retrace their story, visit the balcony, their houses and admire many romantic spots. 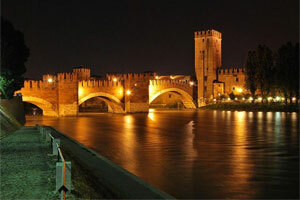 Verona area is the first in the World for different kind of wines. Our wines, like Amarone, Custoza, Soave, Recioto, are famous in all over Europe. In Verona there are a lot of wine tours in the beautiful wine cellars diffused in all the territory. 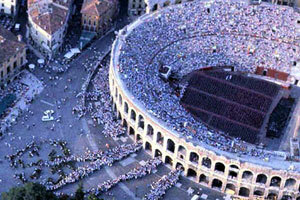 The match between wines and food is a speciality for the tradition of Verona. the pasta Tortellini from Valeggio, a must for Veneto people, or still the «pastisada», horse meat served with Polenta, a pillar of the old Veneto tradition. Brescia, situated at the foot of the Alps is the second largest city in Lombardy, after the capital, Milan, and, counting its Province, it has about 1,200,000 inhabitants.It’s the third industrial and fourth financial area in Italy. The city is very important for metallurgic industry and, in fact it is at the centre of the third-largest Italian industrial area, concentrating on mechanical and automotive engineering and machine tools. Its companies are typically small or medium- sized corporations. The financial sector is also a major employer, and the tourist trade benefits from the proximity of Lake Garda , Lake Iseo and the Alps. But Brescia is also a symbol of ancient art.The city, called Brixia, has been an important regional centre since pre-Roman times and a number of Roman and medieval monuments are still preserved, among which is the prominent castle. You can walk around the centre discovering the beautiful places and historical monuments and the typical architectural buildings. Brescia is renowned for its wines famous all over the World. The «wine land» is departed in more zones: from Franciacorta to Garda Classic and Lugana. The tradional cuisine of Brescia is characterized by vigorous dishes, rich in animal fats, such as lard and butter. Typical dishes are: «Casonziei», a kind of stuffed pasta, «polenta taragna with birds», Tripe in sauce and the delicious soups. Mantova, surrounded on three sides by artificial lakes created during the 12th century, it is the real stage of the famous opera Rigoletto, by Giuseppe Verdi. Vicenza, known as Palladio City, Vicenza is one of the most important artistic cities of Veneto . It’s a UNESCO resource, thanks to its beautiful monuments and its famous Palladio Residences. Verona’s Ponte di Castelvecchio – it’s hard to believe that much encouragement is needed. 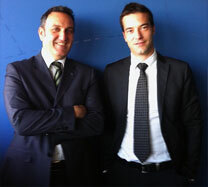 Besides new-entrant incentives and marketing support the Verona and Brescia Airports work closely with handlers and other supply chain partners to produce the most competitive offers for airlines considering new air services. 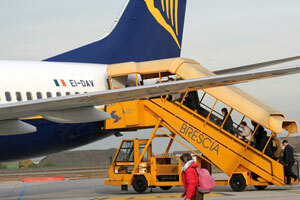 The Verona and Brescia Airports will strongly support Airline Companies for the starting of new routes by providing competitive incentive schemes to promote a profitable business, based on traffic figures and passengers profile; and also by sustaining marketing activities such as flight opening press conference and press release, activities related with the inaugural flight, advertising support, etc. 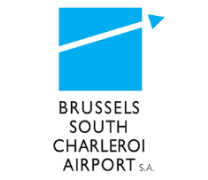 The airport also works closely with handlers and other essential partners in the supply chain to maximise valuable competitive advantages for airlines. The Garda Airport System is a two-airport group comprising Valerio Catullo Airport (Verona) and Gabriele D'Annunzio (Brescia) offering valuable inward tourism and its own large commercially-important catchment area of 10 million inhabitants. Verona Airport is located east of the intersection between the A4 Milan-Venice and the A22 Modena-Brenner motorways, easy to reach from the east and the west. This is a year-round destination: summer season visits to Lake Garda and the historical cities are balanced by winter sports in the Italian Alps – the Dolomites. 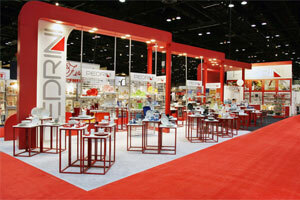 The area is also well-known for its strong concentration of small and medium sized businesses. The PRIMARY market for “CATULLO” AIRPORT in Verona/Villafranca contains the Provinces of Verona, Bolzano, Trento, Brescia, Mantua, Vicenza and Rovigo, covering an area of almost 25,000 sq. km. and serving a population of more than 10 million inhabitants. 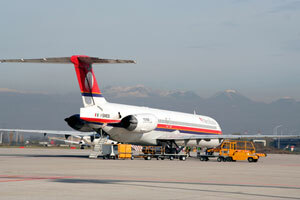 The geographical area takes in three different regions, including South Tyrol with no primary commercial airports. 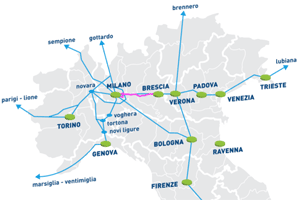 All the provincial capitals are well connected to Verona by major motorways and rail links. This large catchment area is highly productive in terms of agriculture and industry (with a prevalence of small and medium-sized businesses) as well as of service industry. 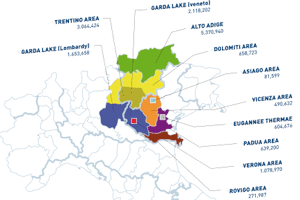 The Garda Airport catchment area has a high number of foreign resident citizens, with residence permit, who came to live around Verona and Brescia, in order to work in the factories, in the agriculture and farming areas. 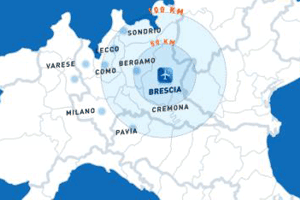 Brescia Airport is strategically located in the centre of Northern Italy. 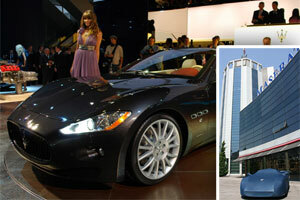 It represents one of the most dynamic areas in Italy In terms of economic development. 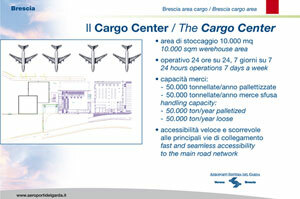 The catchment area of Brescia Airport includes a number of international brands that are leaders in their sector. 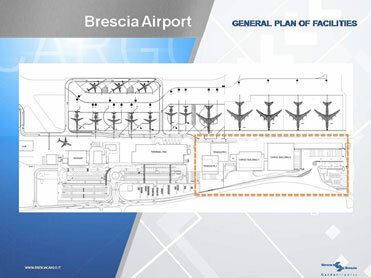 Within the Garda Airports, Brescia focuses on mail and cargo traffic, thanks to its geographic position and proximity to the main motorway infrastructure, which ensures a rapid link within northern Italy and direct accessibility to central Europe. 29 tractors of 20 ton towing capacity. 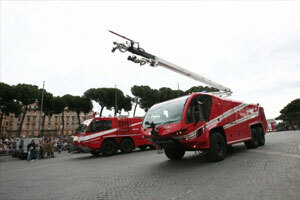 3 ULD Transporters max capacity 15,000 Kg. 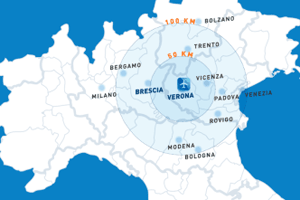 One of the main strong points of Verona and Brescia are their strategic position in the centre of north-eastern Italy. 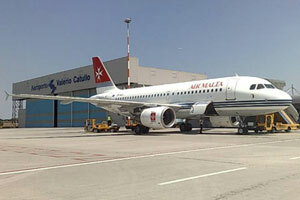 The airports are located at the crossroads of the main Italian east-west motorway system (the A4 motorway between Turin and Trieste) and the north-south motorway (Modena – Brenner) as well as the main railway network. This makes airport access very easy and rapid.